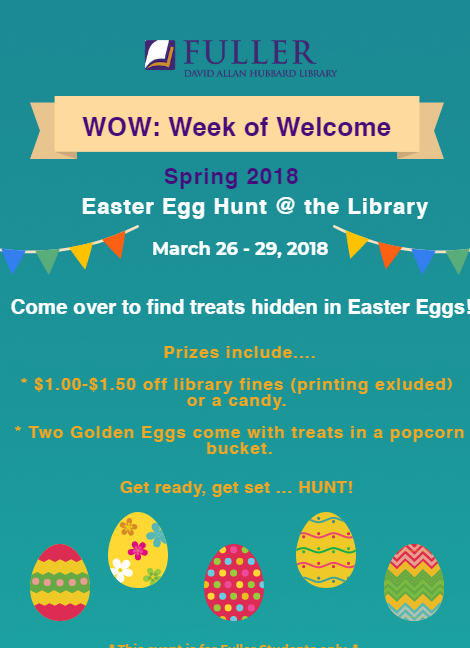 Easter Egg Hunt 2018 at the Fuller Library! 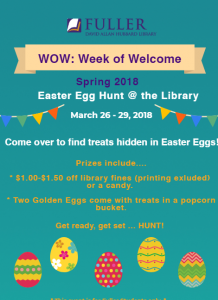 Fuller Library > News > Event > Easter Egg Hunt 2018 at the Fuller Library! From March 26th to March 29th, the Fuller Library will have an Easter Egg Hunt! We have hidden eggs all over the library. If you find one, bring it to the Circulation Desk and get your prize! Prizes include: $1.00-$1.50 off library fines (does not include printing) and candy. But, there are TWO golden eggs hidden as well, and finding one will get you a popcorn bucket. PLEASE NOTE: This hunt is not for children – Fuller Students ONLY! We apologize but will consider having one for children in the future. One egg per person, per day. Egg must be brought to the Circulation Desk and THEN opened. Your name and possibly G number will be written down. Eggs are hidden in areas that anyone can access; none are in staff only areas of the library. They will not be behind stacks of books or large items for you to move. If you chose the Fine Removal prize and have no fines OR your fines are less than the removal amount, no money or change will be given. Fine Removal prize cannot be used as credit toward future fines. Golden Eggs – if you find one, you will no longer be allowed to play (sorry!). This gives everyone else a chance to find an egg, especially a golden one. If you have any questions feel free to email lib-systems@fuller.edu.